Over-the-counter cough and cold medicines are the best way to help a child who has a cold feel better — right? Think again. Cough and cold medicines aren't recommended for children younger than age 2, and the jury is still out on whether cough and cold medicines are appropriate for older kids. So how can you treat a child's cold? Here's practical advice from Jay L. Hoecker, M.D., an emeritus pediatrics specialist at Mayo Clinic, Rochester, Minnesota. What's the concern about cough and cold medicines for kids? Over-the-counter cough and cold medicines don't effectively treat the underlying cause of a child's cold, and won't cure a child's cold or make it go away any sooner. These medications also have potentially serious side effects, including rapid heart rate and convulsions. The Food and Drug Administration (FDA) discourages use of cough and cold medicines for children younger than age 2. Are cough and cold medicines a problem for children older than age 2? 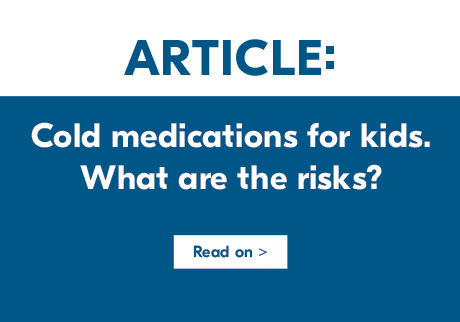 FDA experts are studying the safety of cough and cold medicines for children older than age 2. In the meantime, remember that cough and cold medicines won't make a cold go away any sooner — and side effects are possible. If you give cough or cold medicines to an older child, carefully follow the label directions. Don't give your child two medicines with the same active ingredient, such as an antihistamine, decongestant or pain reliever. Too much of a single ingredient could lead to an accidental overdose. Antibiotics can be used to combat bacterial infections but have no effect on viruses, which cause colds. If your child has a cold, antibiotics won't help. It's also important to remember that the more your child uses antibiotics, the more likely he or she is to get sick with an antibiotic-resistant infection in the future. Can any medications help treat the common cold? An over-the-counter pain reliever — such as acetaminophen (Tylenol, others) or ibuprofen (Advil, Motrin, others) — can reduce a fever and ease the pain of a sore throat or headache. Remember, though, low-grade fevers help fight infection and don't necessarily need treatment. If you give your child a pain reliever, follow the dosing guidelines carefully. Don't give ibuprofen to a child younger than age 6 months, and don't give aspirin to anyone age 18 or younger. Aspirin has been associated with Reye's syndrome, a rare but potentially fatal illness. If you want to give your child an herbal or alternative remedy, consult your child's doctor first. Offer fluids. Liquids such as water, juice and broth can help loosen congestion. Warm liquids, such as tea or chicken soup, might have a soothing effect, increase the flow of nasal mucus and loosen respiratory secretions. Moisten nasal passages. Run a cool-mist humidifier in your child's room. To prevent mold growth, change the water daily and follow the manufacturer's cleaning instructions. Steam from a hot shower might help, too. Use a suction bulb for a baby or young child. This device draws mucus out of the nose. Squeeze the bulb part of the syringe, gently place the tip inside one nostril and slowly release the bulb. Use saline nasal drops. Over-the-counter saline nasal drops — or saline spray, for an older child — can loosen thick nasal mucus and make it easier for your child to breathe. For babies or young children, follow up with a suction bulb. Soothe a sore throat. Ice cream, frozen fruit pops or cold beverages might feel good on a sore throat. For an older child, gargling salt water or sucking on a piece of hard candy or a throat lozenge might offer additional relief. Hard candy and lozenges — both choking hazards — aren't appropriate for younger children. Encourage rest. Consider keeping your child home from child care, school and other activities. What's the best way to prevent the common cold? Keep it clean. Teach your child to wash his or her hands thoroughly and often. When soap and water aren't available, provide an alcohol-based hand sanitizer or hand wipes. Keep toys and common household surfaces clean, too. Cover up. Teach everyone in the household to cough or sneeze into a tissue — and then toss it. If you can't reach a tissue in time, cough or sneeze into the crook of your arm. Steer clear of colds. Avoid close, prolonged contact with anyone who has a cold or other communicable infection. Don't allow children to share cups or utensils. It's also important for your child to eat a healthy diet, get plenty of sleep and stay current on his or her vaccinations — including a yearly flu vaccine.